As some of you already know, we spent most of 2017 boomeranging in and out of our home while it was being (almost literally) gutted and rebuilt. During this time I treated my clients out of Falmouth Natural Health Practice which was great (and I may continue to work there at weekends in the future). However, the plan has always been to get back into my home and create a new bespoke treatment space. 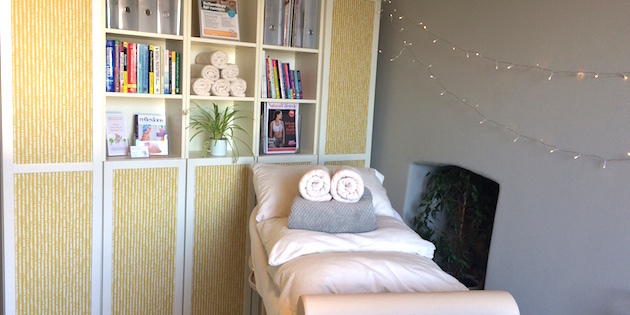 Having a home treatment room enables me to create a warm, authentic and professional space which I'm completely comfortable in which, in turn, will enable my clients to relax and focus on their well-being. And so after lots of long days filling, sanding, painting (eco, of course) and cleaning, plus a fair amount of time rearranging furniture, equipment and plants, it's now ready. Yay! The entrance to my house and room is still very much a work in progress, bear with me, I'll get there as soon as I can! Just know that once you arrive, the treatment room (and bathroom) is warm, clean, decorated and ready for you. My aim with this new space was to create a calm, contemporary and nurturing environment where you, as a client, can completely chill out, take some time away from your busy life, and feel looked after. The choice is yours whether you want to get really cosy and have the window blind down, or relax and enjoy the ever-changing views over the Penryn River, Trefusis Point and beyond! I love this room, I really do, it's my very own happy space which I hope will have a positive impact on your well-being too. I can't wait to start looking after you all from here!